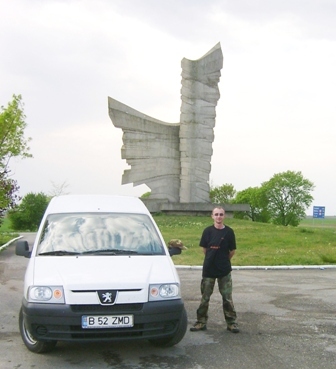 in June 2001, I was traveling from Bavaria, Germany, to vist Deva, Hunedoara County, Western Romania. Shortly after leaving ARAD a main town situated close to the Romanian-Hungarian border, I spotted a large monument in the distance through the front window of the bus, snatching up my camera, I snapped the following picture of this impresive looking monument. Close up photos to be added. The centre piece is a representation of a WW2 Romanian soldier. 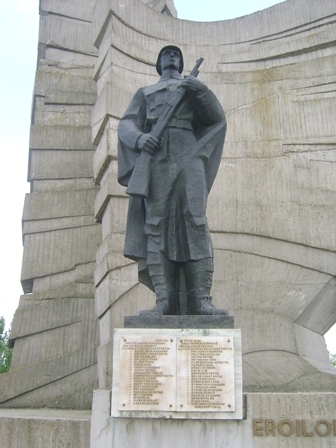 Under the statue, are listed the names of the Officer Cadet Class, who helped to block the advance of the Hungarian Forces at this spot in 1944. SUB-LCT CISMARU GHEORGE. / SUB-LCT POPESCU DARIUS. SERG-MAJ. BICHA ERNST. / SERG-MAJ. CALIN TANASE. 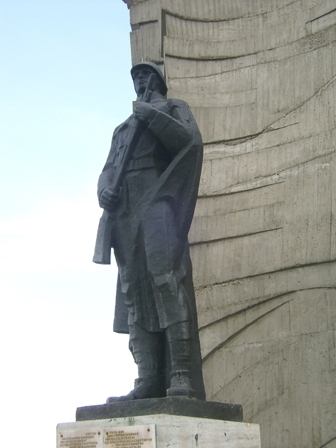 ELEV-SERG, ATANASIU CONSTANTIN. / ELEV-SERG. UNGELESCU CONSTANTIN.
? BABALAU ALEXANBRU. / ? MACHENICI DUMITRU.
? BADONIU CONSTANTIN. / ? MILITARU NICOLAE.
? BALAN BALAN. / ? MOTEA PETRE.
? BALESCU PAUN. / ? MOTREANU IOAN.
? BLAGA TOMA. / ? PLOPSOREANU APOSTOL.
? BOBEI IOAN. / ? POPESCU EMIL.
? CASOTA GRIGORE. / ? PREDICA MARIN.
? CONDA PETRE. / ? RACIU ILIE.
? 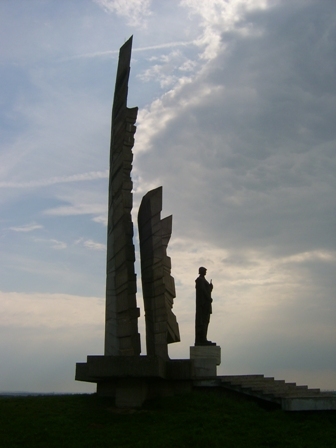 CODREANU VASILE. / ? RADUCANU PETRE.
? COMANESCU CONSTANTIN. / ? SELA CONSTANTIN.
? DASCALU IOAN. / ? SINITIEANU EMIL.
? DOBRITOIU IOAN. / ? SPARLEANU LEON.
? DUMITRESCU IOAN. / ? STAMATIOU GHEROGE.
? ECOVESCU IOAN. / ? STANESCU IOAN.
? FOTA MIRCEA. / ? STOIAN ALEXANDRU.
? GHEORGE DUMITRU. / ? STROIE AURICA.
? 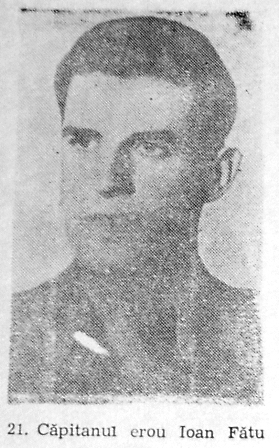 IOVI TIBERIU. / ? SUCIA ALEXANDRU.
? IUGA IULIA. / ? SERB NICOLAE.
? JIANU SCARLAT. / ? SOSI IOAN.
? LERA SLOBODAN. / ? WEICHERT CORNELIU. 13 - 25 SEPT. 1944. Please Note: ELEV-SERG is the Romanian abbreviation for Sergeant-Student. 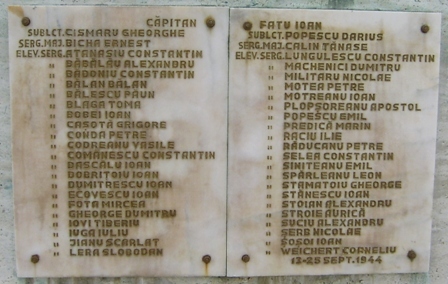 HEROS OF THE DETACHMENT PAULIS. 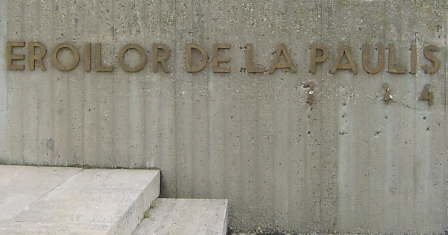 THE TITLE OF THE MONUMENT. 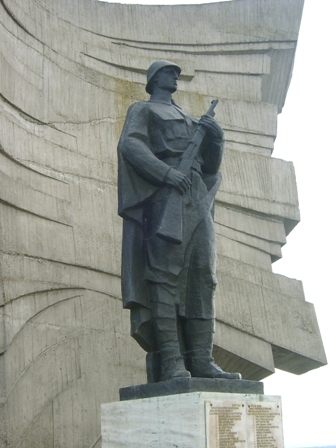 This sign signifys that its a National Monument and gives some details of the designer, etc.. etc..
Left side view of the soldier, showing the characteristic shape of the "Dutch Helmet" worn by the WW2 Romanians. The helmets were supplied by the Germans from captured Dutch stocks after Holland was over-run. The right-hand side of the soldier. 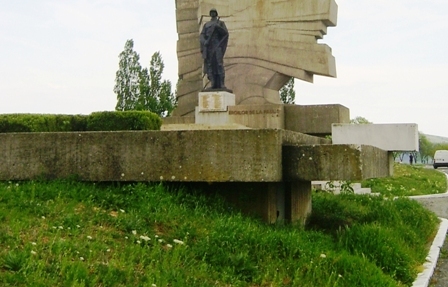 Side profile of the monument. The piece immediately behind the soldier represents the wings of victory. 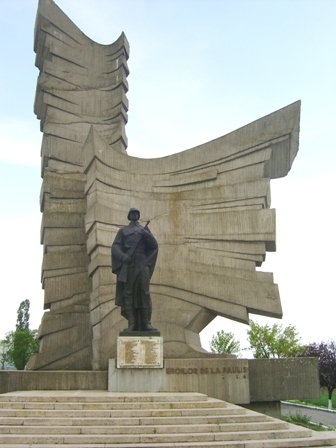 The large piece to the rear represents the flames / desire in the hearts of the soldiers to win. Silently, guarding the place where so many gave up thier lives. Another front view to help with the perspective of the design. 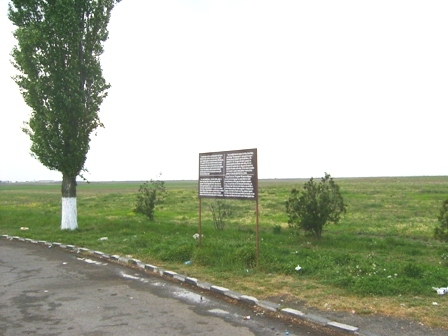 Risking life and limb, I crossed the very busy road to get a picture of the sign located in a lay-by, first in English. I kid you not, the traffic along here is horrendous, why they never put a sign on both sides of the motorway is beyond me. 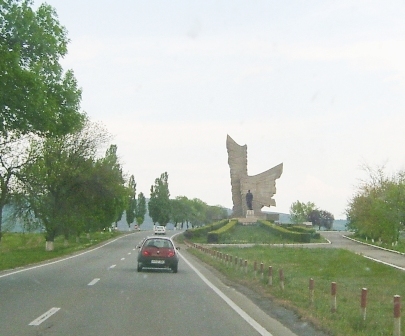 This picture shows the wide open plains to the right of the monument from the rear, just after you emerge out from the Mures River valley. Good Tank country, but very scarse cover for the infantry. The fighting from here towards ARAD was articularly savage, involving units of the SS, once ARAD fell the road to Budapest was open. The fields to the left hand side of the monument rear, now prime agricultural land, a far different crop was sown here in 1944. At first I was stumped as to what the structure was for. The end of the marble block had this carved into it, and here I would ask Carol I for a translation. 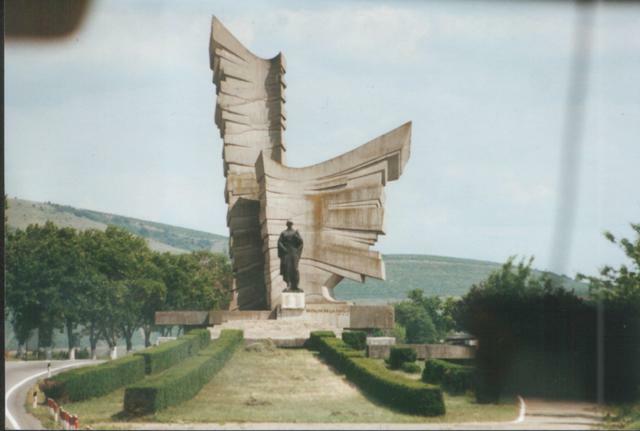 SINITEANU ∙ VASILE ∙ CODREANU ∙ BALAN ∙ BALAN ∙ ILIE ∙ RADU ∙ IOAN ∙ DUMITRESC ∙ ALEXANDRU ∙ SUCIU ∙ EMIL ∙ POPESCU ∙ MARIN ∙ PREDICIA ∙ IOAN ∙ SOSOI ∙ CONSTANTIN ∙ LUGULESCU ∙ IAON ∙ DASCALU ∙ CONSTANTIN ∙ ANTANSIU ∙ LERA ∙ SLOBODAN ∙ ION ∙ECOVESCU ∙ PETRU ∙ RADUCANU ∙ ION ∙ BOBEI ∙ MIRCEA ∙ FOTA ∙ CONSTANTIN ∙ COMANESCU ∙ AURICA ∙ STROIE ∙ IULIU ∙ IUGA ∙ ERNEST ∙ RICHA ∙ NICOLAE ∙ MILITARU ∙ GRIGORE ∙ CASOTA ∙ DUMITRU ∙ GHEORGE ∙ PETRE ∙ MOTEA ∙ TIBERU ∙ IOVI ∙ IOAN ∙ DOBRITOIU ∙ ALEXANDRU ∙ BABALAU ∙ EMIL ∙ STANESCU ∙ NICOLAE ∙ SERB ∙ PETRE ∙ COANDA ∙ GHEORGIE ∙ STAMATOIU ∙ DUMITRU ∙ MECHENICI ∙ APOSTAL ∙ PLOPSOREANU ∙ CORNEL ∙ WEICHERT ∙ CONSTANTIN ∙ SELEA ∙ PAUN ∙ BALESCU ∙ NICOLAE ∙ IVAN ∙ SERGENT : ELENA ∙ CHIRITA. So is the "bunker" an ossary?? must investigate. (in fact he is the guy who introduced me to Adriana my Romanian wife ). 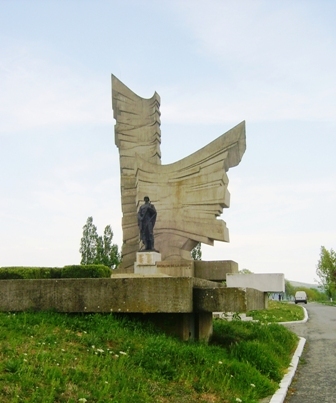 The monument is one of the largest I have seen in the area where I live and I will try to add some more information with regards the fighting in this area in WW2, hope you like the tour. 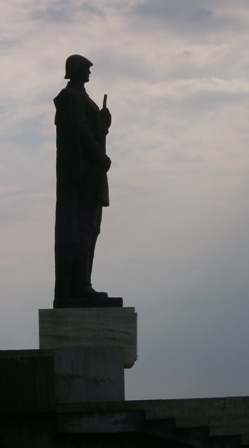 Kevin, this is a monument to the heroes of the battle of Păuliş, most of them only cadets at the time of the battle. 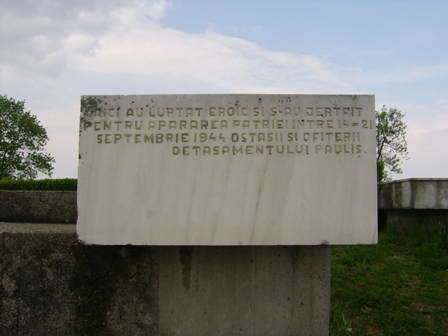 Here it comes: "Here, the soldiers and officers of the Păuliş Detachment fought heroically and sacrificed themselves between 14-21 September 1944 for the defence of the motherland." Hi kevin, a most interesting and impressive monument. Forgive my stupidity but I assume this is an anti-fascist memorial. 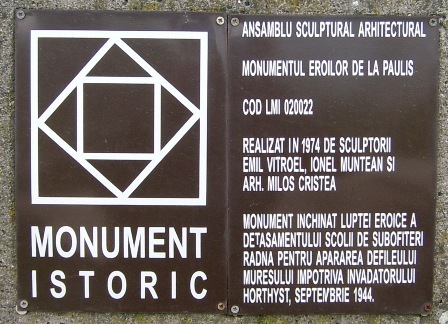 It's located beside a very busy main road and probably hundreds of people traveling to the Romanian / Hungarian border passit without realising its significance. In the book "CEL MAI GREU EXAMEN PAULIS - 1944 by Dumitru Susan, can be found a few pictures of the men involved in the battle.